Mobile, portable cleanroom that's easily deployed at any naval base. The U.S. Navy requires precision cleaning and testing of all its oxygen and oxygen-enriched systems and components. Life support systems for Navy divers require this maintenance every three years. According to the stringent military standard written by the Department of Defense, the diving equipment must be serviced in a controlled environment that is equipped with a laminar hood and water purification system. In the past, the Navy used outside commercial vendors to service their equipment but had little control over the price and quality of service. To ensure that the equipment was maintained according to specifications, the Navy had to perform expensive quality audits. The Navy came to Lasco Services with these concerns. 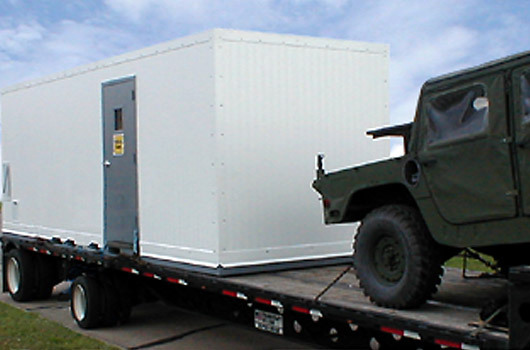 They needed a structure that could contain a cleanroom and cleanroom equipment and was mobile so that it could be easily deployed at any of their naval bases. This meant the mobile cleanroom would have to endure a wide range of harsh environmental conditions. The Navy wanted the cleanroom to be completely self-contained with all the requisite equipment in place, a single utility connection and nothing protruding outside of the perimeter shell. Lasco began by constructing the walls and ceilings with insulated wall and ceiling panels that could not only withstand external conditions but also efficiently control the temperature and humidity inside the cleanroom. The 8'W x 24'L x 8'H cleanroom was constructed on top of a custom steel base allowing it to be moved by a forklift. The structure was divided into three rooms, two for cleaning operations, and one small gowning vestibule that also housed the HVAC equipment and main electrical panel. The Navy anticipates placing Lasco Services' custom portable cleanrooms in strategic naval locations throughout the world, saving tax dollars, assuring quality control, and providing greater flexibility in maintenance operations.